We have a saying in my family, “Do all the good you can…” It is a phrase that I ponder often and it has affected the profession I’ve chosen, the callings I try to fulfill, the way I mother my children and interact with the people around me. This simple, yet expansive personal mantra has become the cause of my life and it is something that is incredibly meaningful to me. I was thrilled when Sister Carol F. McConkie, 1st counselor in the Young Women General Presidency, began her talk by encouraging the young women, and by extension all the women of the Church, to have a cause. She argued that having a cause gives us a reason to act and serve in the glorious work of the gospel. One thing I especially appreciated was that Sister McConkie immediately tied this great cause to Jesus Christ. After two talks focused on other issues, it was refreshing to hear such powerful words about the mission and atonement of our Savior and the role we can play in that. I loved how McConkie emphasized that we are all valued and needed in the cause of Christ. She urged us to love one another and see the beauty in the lives and experiences of all of our sisters. She wisely counseled us not to compare ourselves to one another for that is wasted energy and doesn’t further the work of God. 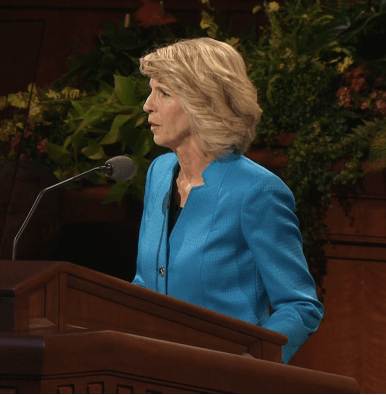 There was an incredibly important moment in her talk when Sister McConkie spoke, without qualification, of young women ministering to each other. So much of the work of women is ministering, yet it is rarely called such. I am grateful to Sister McConkie for recognizing that words have power and using her podium to broaden the rhetoric surrounding women’s service. McConkie quoted John Widstoe as saying, “Since the plan is intended for all, we become parties to the salvation of every person on the planet. We agreed, right then and there, to be not only saviors for ourselves, but measurably saviors for the whole human family.” It is a powerful quote and I loved that she tied it to the image of sisters,–past, present and future–united in the cause of human salvation. As wonderful as most of Carol McConkie’s talk was, I was disappointed to hear her repeat the common adage that marriage and family are the most important cause for women. While certainly important for some women, it just isn’t true for all women and can therefore be incredibly hurtful. Though unsaid by Sister McConkie, I think it is clear that individual women’s causes will often look and be different. We need to take her at her word that the individual experiences, service and faith that comprise the causes of women are indeed beautiful and valuable, even when they are different. I echo Sister McConkie in the hope that we can all stand together with a song in our hearts and build the Kingdom of God–knowing that the most beautiful songs have harmonies. Thank you for your thoughtful review, Meghan. I too, thought this was a powerful address. Interestingly, I heard one part a little differently and it stuck out to me. I heard her say that “preparing” for marriage and family is the most important way to further Christ’s cause, even if it is not our experience. I thought this was a relevant distinction, although I would not have appreciated it at all before I was married and had a family myself. And of course, preparing for marriage and family may look very different from woman to woman. Personally, I feel my mission was possibly the best preparation I could have had for having children, and my university and post-grad education were invaluable preparation for my marriage. Those were my personal thoughts and impressions, but her exact meaning may be clearer once we get the published talk. Thanks for your thoughts, Erika. It’s very possible we could have heard her counsel differently. (I had a couple of whiny kids demanding milk at that moment). I still hope that in the future we encourage girls and women to prepare for the many causes that will fill their lives, without prioritizing one over another. I only jot down poignant words which reverberate on my soul during these addresses. I really appreciated her, “ALL are valued, ALL are needed.” In the cause of Christ as women disciples, that is, so very true. Those words resonated with me as well, Janelle. As simple as those words are, they are profound and often difficult words to live by. I hope that we remember that counsel as we encounter people who think or act differently than we do. I felt so excited during this talk. It’s something that I need, and I think many people – men and women – in my YSA ward need. I thought for a second that she was going to present a specific goal for the women of the church to work towards, especially because of watching all the interviews to do with the UN meeting coming up, emphasising education for women worldwide, and because of the rising number of refugees who need help. It was a little more general than that, but I hope it really does lead to women and girls finding a cause. I, for one, realised that I’ve (yet again) been called to the work by my own conscience, and while it would be lovely (and easier) to have that be a worldwide goal, and work together with all my sisters, that’s not actually necessary for me to do something about it. I too was a little disappointed that Sis. McConkie didn’t broaden the horizons of what is possible for women’s causes. I am grateful though that she started using that word. I think once a concept is introduced it is much easier to expand it. Hopefully we will start hearing more about the different causes women can pursue other than being a wife and mother. And I would love to hear more about your cause, Olea! Please submit a guest post!!! I had some big problems with this talk, since it seemed that all she was advocating that we have as our “cause” is paying attention to our own salvation. I kept waiting for her to urge us to do temple work, but no. I know this is minor and not actual commentary on the content of her talk, but I appreciated the strength of her voice. Despite the objectionable parts of her talk, the “finding a cause” parts resonated with me because they were given with a clear, strong voice (as opposed to “Primary Voice”).